Feel confident with smooth, flawless skin! The Ageless Derma Baked Mineral Makeup Foundation definitely brings out the best version of your skin with its natural and flawless finish. It features an advanced formulation that has the capability to adjust to your natural skin tone. It involves light refracting pigments that create an effect that makes your complexion perfectly even. 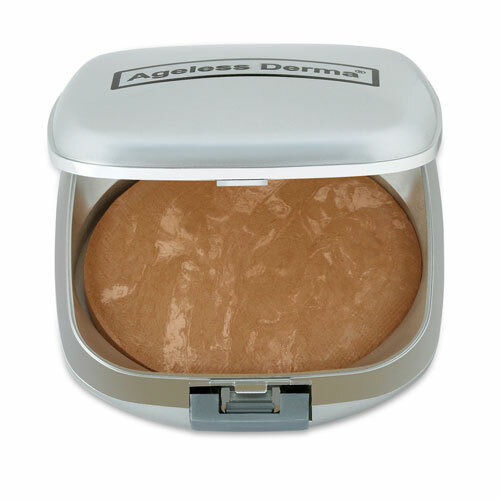 The Ageless Derma Baked Mineral Makeup Foundation is perfect to those who seek a smooth, matte finish without giving the skin a heavy feeling. As our Mineral Makeup Foundation is baked and not pressed, it efficiently delivers exceptional color payoff as it blends smoothly on the skin. Its rich, creamy texture and finely-sifted formula makes the foundation itself quite easy to blend. It’s definitely your must-have product for it is perfect in completing a natural no makeup look. This foundation is ideal for men, women and teens who want a fresh and natural daily makeup look. Expect medium to full coverage in just a couple of layers with the Ageless Derma Baked Mineral Makeup Foundation! Additionally, our Baked Mineral Makeup Foundation is richly infused with natural ingredients. These botanical ingredients are rich in nutrients and antioxidants; making sure that your skin is well taken care of. Unlike most heavy-duty foundations, this one does not dry the skin. Its premium natural ingredients provide nourishment into the skin to make it look more youthful and well-hydrated. Using a kabuki brush, swirl it onto the pan and buff it all over the face for an even, airbrushed coverage. For troubled areas that require more coverage, use a Pony Flat Brush and lightly dab it over for a flawless but natural finish.